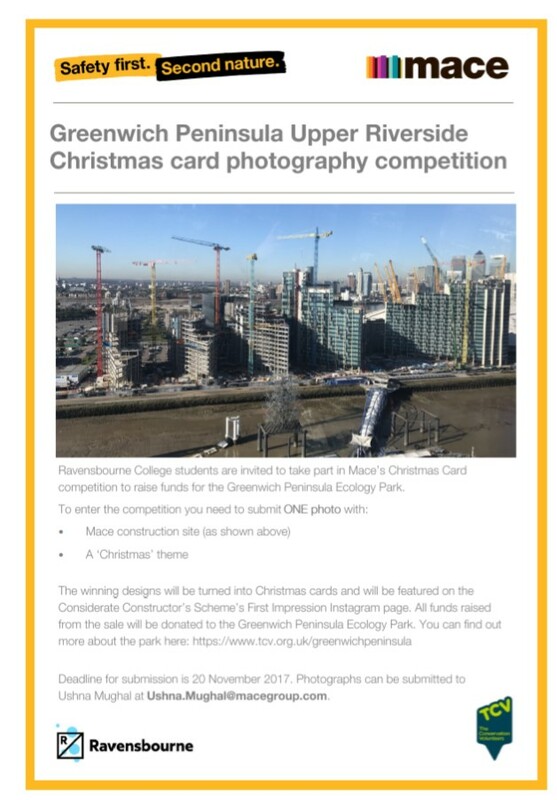 During the festive season, the Mace team at the Greenwich Peninsula Upper Riverside development have set up a Christmas card appeal to raise funds for the local ecology park. Ravensbourne College students were invited to take part in Mace’s Christmas card competition during which students entered photos which represented the theme of construction as well as Christmas. The winning designs were turned into Christmas cards which allowed us to showcase local talent, while raising money for a worthy cause. All funds raised from the sale are currently being donated to the Greenwich Peninsula Ecology Park which is an urban oasis for wildlife and people within a rapidly developing area of London. The park is home to a fascinating variety of wildlife as well as a tranquil oasis for people to discover and enjoy. The Friends of Greenwich Peninsula Ecology Park supports education, volunteering, events, holiday activities and wildlife survey work at the park through local fundraising and grants. This will be an online campaign that will directly benefit the charity on an ongoing basis and will leave a long term legacy.